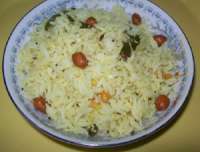 This phodnicha bhaat is a spicy tempered rice recipe from Maharashtra. It is a one dish meal and easy to make. It is made using left over rice. You can make it with freshly cooked rice too. Though this phodnicha bhaat is a Marathi fried rice recipe, most Indian states have their own versions of this spicy seasoned rice. It is known as Talimpu annam, popu annam, thalicha sadam etc in the south Indian states. Phodnicha bhaat is usually made to use up left over rice. But it is so tasty, that you will want to make it with freshly cooked rice when there is no left over rice. 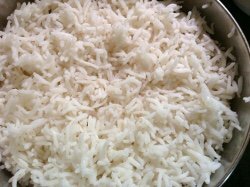 Leftover / refrigerated rice is usually a little dry and you can use it as it is. The rice for this recipe should not be mushy. So add a little less water if making fresh rice. Let the rice cool a bit (so that it does not break while mixing) before adding to the tempering. You can make it for any meal, breakfast, lunch or dinner. 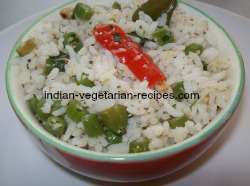 Make it when you do not have time to cook an elaborate meal, accompaniments for plain rice. Green fresh or dry red chili - 1 No. If rice is lumpy, break the lumps using your fingers or a fork. Keep aside. Add chopped chili, curry leaves. Fry for 5 seconds. Add chopped onion and fry for a few seconds. Cover and cook for a minute or two, till onions are just done. Add rice, red chili powder and salt. Mix well. Phodnicha bhaat / spicy tempered rice is ready. 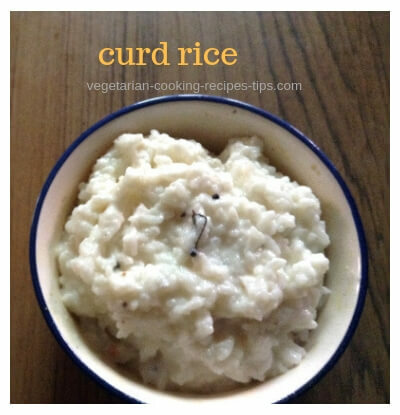 Serve it as a meal by itself or with a cucumber or tomato salad and papad. The combination of turmeric and red chili powder gives it a lovely color. You may add 1/2 tsp chana dal and 1/2 tsp urad dal after the mustard seeds have crackled. You may add 1/4 tsp rasam powder or sambar powder. You may add other chopped vegetables such as potato, fresh green peas. I usually add only onion.